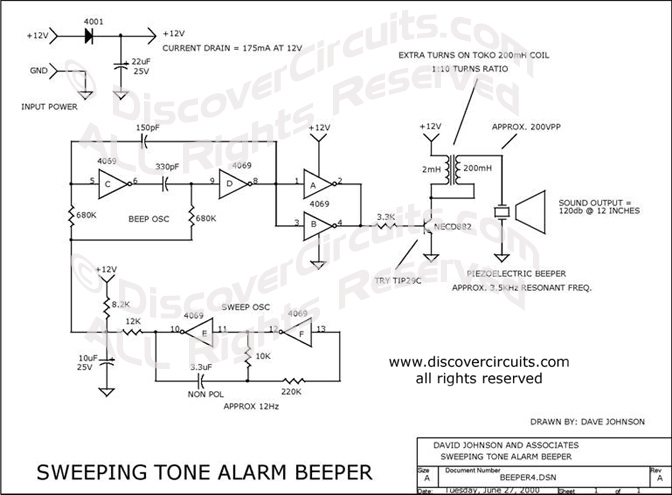 Circuit: ANOTHER VERY LOUD PIEZO ALARM BEEPER __ Circuit designed by David A. Johnson, P.E. This is yet another beeper circuit that really draws attention. It sweeps the drive frequency slightly to produce a very annoying sound. It uses a transformer to increase the drive voltage across the piezoelectric device to more than 200 volts peak to peak. It cranks out an ear splitting 120db when measured at 12 inches.